Beyond School centers upon the weeks leading up to 17-year-old Shail’s final board exams, as his world becomes a pressure-cooker and the weight of preparing for the exams sends him fleeing rebelliously in the other direction. Along with Shail’s journey from boyhood to manhood, Beyond School vividly weaves between the narratives of four main characters, seamlessly uniting the past and present of Shail, his parents-Urmila and Sushil and his mentor-Gladys, in a story that is honest, funny, heartbreaking and ultimately, incredibly human. Chitra Anand was born in Mumbai. She is a postgraduate in Physics and holds an Education degree. Beyond School is her first novel inspired by her journey as educator. Shail, is confused and uncertain about exams. But, determined to become a great football player. Urmila and Sushil are the coolest and friendliest parents ever. They are progressive and tried their best to be the best! Gladys is the most approachable teacher. She is empathetic and hence, children obeys to her. To begin with, the cover page is perfect and suits the storyline. 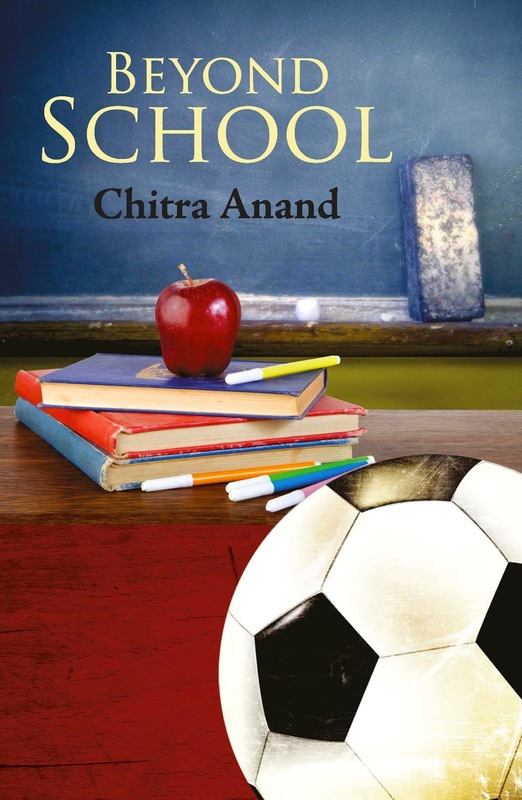 It has a set of books symbolizing studies/exams, blackboard and duster implying school/teachers and football emphasizing the protagonist’s (Shail) passion. The title is appropriate as well because it conveys that there is life beyond school and exams… that so much depends on upbringing and that one need not focus only on studies; marks and degrees are no measure to a person’s caliber. Then, the book blurb, gives a background on what can be expected from the book. The narrative is simple. It shifts between the present, Shail’s life and also the past describing Shail’s parents’ and Gladys’s life. This is a unique treatment which re-emphasizes that child is indeed the father of man. The characters are well-sketched. Shail’s parents are very progressive. They are understanding and caring. They are friendly and approachable. They reminded me of my own parents. So are Gladys’s and Urmila’s parents. However, Sushil has a tough father. The author has beautifully depicted the importance of parents in a child’s life. The book also touches important aspects, marks need not reflect anyone’s caliber. Grabbing a good job which offers hefty pay package need not be the determinant for anybody’s success. There are can be other ambitions too like becoming a sports person, writer and so on. However, the fact remains that no child can pursue his passion without parents support. This book may be about a confused teenager. But, this book is not just a children’s book. This is relevant for people belonging to all age groups. nice...the premise of the book sounds nice...and though culturally different as far as the exams, we have them from the state each year...so is the audience teens? or adults? As I said, this book can be enjoyed by both teens and adults. Also, very relevant to parents and teachers.